Good serious players start to get into ratings and ranks. As in Judo and other Oriental pastimes, there are Dan rankings, starting a 1-dan and going up (in theory) to 9-dan. Actually there are no amateur players above 6-dan, I think. Then there are the Professional ranks, which start at 1-dan and go up to 9-dan. There is also a 10-dan title which is won by competition. A Professional 1-dan is much better than an Amateur 1-dan, as you may imagine. 1-dan is also called shodan. But for the rest of us, there are "kyu" ratings, which represent the number of handicap stones we would take if we were to play an Amateur 1-dan. In other words, if I took 5 stones handicap from a 1-dan and played a reasonable game (i.e. won, or lost by no more than 10 points), I would consider myself as a 5-kyu player. You can get more "official" ratings from the American Go Association or the equivalent organization in other countries. 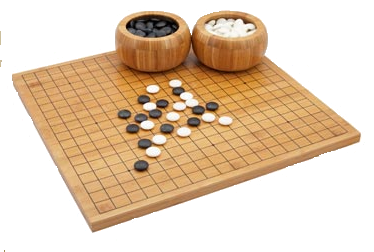 Just to make things a little more complicated, the European Go ratings are stricter than the American ones, so a European 9-kyu is more like an American 5-kyu.